Bendix Titanium Stripe saves you time and money. Titanium Stripe gives instant friction and positive pedal feel, the moment your customers drive out of the workshop. 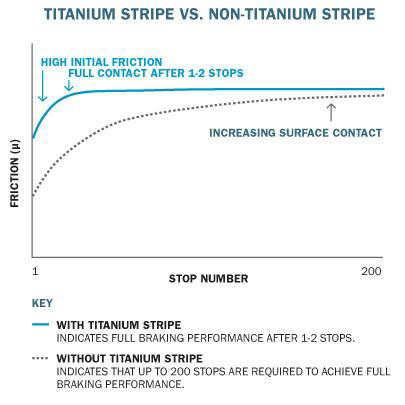 The high friction titanium coating on the brake pad surface mates quickly to the rotor when brakes are first applied and full braking performance is achieved in a few stops. Normal bedding-in procedure is a minimum of 30 stops. That’s 10 minutes of your time that could be better spent on other jobs!